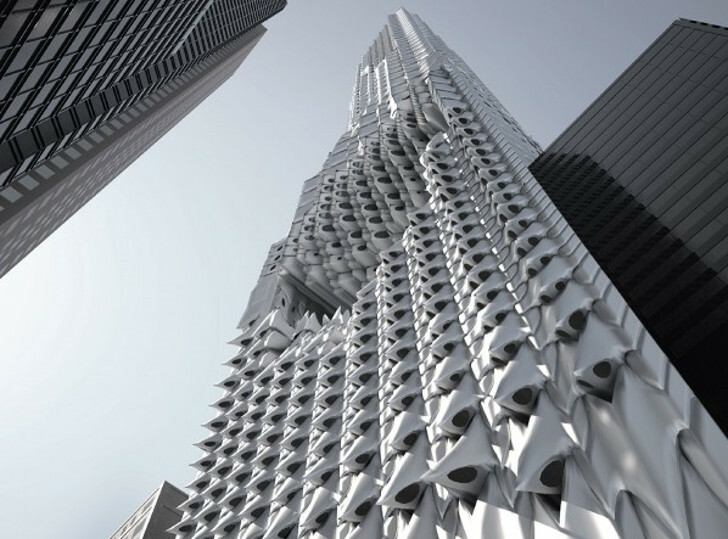 Architects Yongsu Choung, Ge Zhang, and Chuanjingwei Wang took inspiration from the adaptability of sharks for their proposal for a building at 157 West 57th Street in Manhattan. The design, called ‘Deep Skins’, aims to discard the characteristics of a typical NYC skyscraper and create a new typology featuring a futuristic exterior inspired by shark skin. The concept recently received an honorable mention in the 2015 eVolo Skyscraper Awards. The architects of Deep Skins aimed to turn their backs on existing architecture methodology to reach for something completely different. One of the biggest departures in the design is the relationship between indoors and out. Unlike a traditional skyscraper, which might boast broad panoramic views and swooping vistas, Deep Skins focuses on a more intimate and community-oriented way of life. The building will have round apertures that cantilever outward, which the architects insist will place more of an emphasis on the physical appearance of the tower. Deep Skins is just a concept for now (there is currently a 300-meter-tall residential skyscraper under construction at 157 W 57th St), but the proposal accomplishes what it set out to do, which was to make us think about new ways to approach architecture in New York City. This proposed tower is intended to stand as a counterpoint to the traditional glass-and-steel structures that make up the majority of the NYC skyline now.